McDonald's has added to their 'snack wrap' line with the new Honey Mustard Snack Wrap. In addition to the new flavor, McDonald's portable wraps are now available in both grilled and crispy choices. The new Honey Mustard Snack Wrap, made with either grilled or crispy, chicken breast meat, cheddar jack cheese, crisp lettuce and a sweet and tangy Honey Mustard sauce, wrapped inside a soft flour tortilla, will be offered for a promotional period at $1.29 at participating McDonald's restaurants nationwide. "Offering our customers a variety of great tasting, top quality food choices at a value is always a key priority for McDonald's," said Don Thompson, President, McDonald's USA. "As the eating habits of people change and snacking becomes a way of life for many consumers, McDonald's is committed to offering our customers more portable, high quality food options that fit their needs." The new Honey Mustard Snack Wrap has 320 calories, 15 grams of fat, 4.5 grams saturated fat, 1 gram trans fat, 30 grams cholesterol, 750 mg sodium, 34 grams carbohydrates, 1 gram fiber, and 14 grams protein. And there it is, more trans fat. You'd think McDonald's would at least eliminate trans fat from the NEW items! A look at the ingredients list for the chicken used in the wrap reveals the trans fat culprits: hydrogenated soybean oil, partially hydrogenated soybean oil, and partially hydrogenated corn oil with TBHQ. 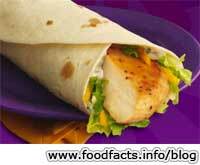 Unfair post... You have a Grilled Chicken Snack Wrap(tm) pictured yet you cite the calories for a regular Snack Wrap. Grilled w/ Honey Mustard is only 260 calories. I'll take a Snickers bar for 13 more calories. Why don't we get EMOTIONAL! about trans fat shall we? If MCD's wants to create unhealthy food that's fine. Remember when you purchase something YOU are OFFERING to buy it. Contract law refers to you as the OFFERE, or the person who WANTS to purchase THEIR product. If YOU don't want transfat, DON'T OFFER TO BUY IT. Who goes to McDonald's with the intentions of eating healthy?